I wake up to the sound of our people reading the Sunday paper, watching the news and drinking mom’s favorite beverage (her morning time coffee)! I nudge my sister and make the familiar wake up sound. My sister likes to sleep a little later. I insist she gets up and I give her two very loud barks………… she stretches……. Does she not know what day it is? It’s Sunday and this is a big park day for us. I decide to climb up on my peoples’ bed and check the weather out the window while I wait for my sister to roll out to the front room and get in position. Yup, it’s a warm sunny day at my house that means the dog parks will be very busy! We must get there as soon as possible! I check on my sister, yup she is up and on her way to get in position. I join her. You see on Sunday morning our people take us for big park hikes in the areas around Vernon, BC but sometimes they need motivation. I walk into the living room and see my sister in position. I sit down beside her. I give her a once over to make sure she has the right look……… she does! My sister and I are hound dogs. 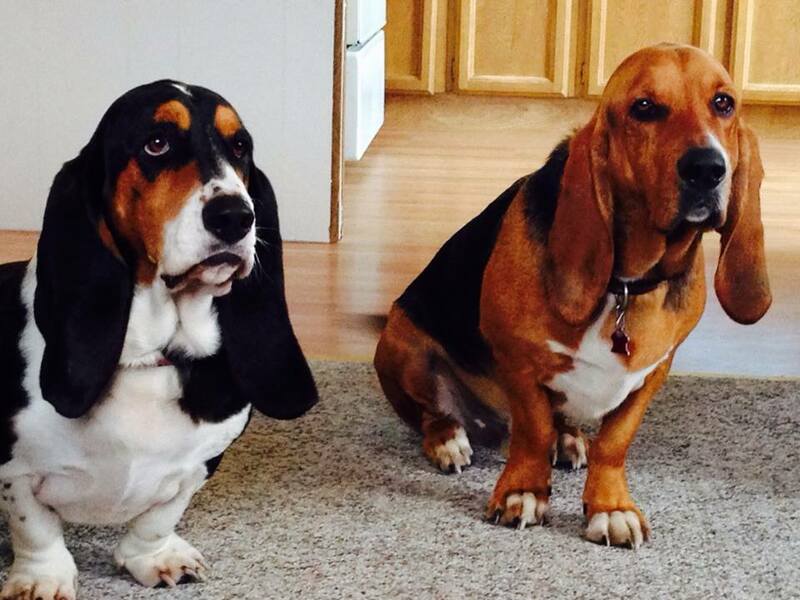 Not just any hound dogs we are Bassetts and the unofficial mascots for Tourism Vernon. My official name is ‘Tourism Tucker’ and my sister is ‘Emma Lou – Lady of the Lakes’. We love living in Vernon because there are many spots for us to run off leash and visit our other canine friends. Sundays are special because often our best friends join us! There are Lilly, Daisy, Toby, and Sage! As we continue to sit and stare at our mom and dad hoping they are getting the message that we are ready the excitement builds! My sister starts wagging her tail uncontrollably. I nudge her as it wrecks the effect of the stare down. At last, our people begin getting ready to head out on an adventure! We hope our mom just wears a hat so we don’t have to wait for her hairdo! At last, we are loaded in the truck on our way to the BX Dog Park! The BX Dog Park is one of many in the area. We arrive at the park and wait for our people to get dog clean-up bags. All the dog-friendly parks and trails in our area have bags provided by the City of Vernon and the Regional District of the North Okanagan. They also keep the grass mowed and the garbage changed they must really love us. We jump out of the truck in a second so fast our parents struggle to catch up. The land for many of the dog parks and trails in and around Vernon, BC were donated or purchased by the local government. We also love to go to Mutrie Dog Park with our dad during the week which is a nice change for us. If you are looking for a harder work out Kalamalka Lake Provincial Park is amazing for people and pups alike and there is only a 10-minute walk to the Pet Beach! This is the perfect place to play and swim on a hot, summer’s day! We are very excited for the new Okanagan Rail Trail to open in Vernon, BC soon! We can’t wait to run and play right along Kalamalka Lake and away from all the busy traffic and noisy cars! If we wanted to we could even walk all the way to Kelowna! If you are looking for a place for your human to take you to, Tourism Vernon has a great list! They even have a map so you won’t get lost on the way and go barking mad! Most of the other dogs at the parks are locals but some come from far away. As we are ambassadors for Vernon we make sure to welcome them with a sniff and a visit. We simply can’t wait to meet you in Vernon, BC! Come visit us soon, we have plenty of pet-friendly everything!